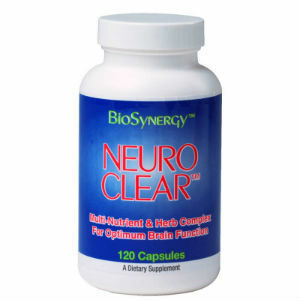 This review will investigate the product Neuro Clear Brain Health & Memory Enhancement Supplement manufactured by BioSynergy Health Alternatives. This supplement is supposed to improve mood, memory and learning while reducing anxiety and enhancing your ability to cope with stress and is supposed to be particularly beneficial for those who have taken drugs or alcohol recreationally. It bolsters nutrients necessary for proper brain function by restoring and providing them. If you want to learn the ingredients contained in this product and find out what information we have gathered about it then continue reading. The product’s composition has been carefully composed so that the ingredients can have a stronger effect when combined with one another than they would if taken individually. Phosphatidylserine and DHA are believed to rebuild damaged or lost brain circuits when used in combination with one another. DHA is also meant to maintain visual memory, cerebral brain volume, executive function and the ability to think abstractly. Phosphatidylserine aids in the production of a chemical needed for memory and learning, provides energy for brain activity, helps coping with stress and oversees nerve health. Overall, it works to support better learning, memory, recall and concentration. The other ingredients also contribute to boosting mental performance. It is not stated if vegetarians can take the product. Four (4) capsules are to be taken daily. It is suggested that two (2) capsules be taken with breakfast and two taken with lunch. The amount to be taken implies that this supplement is weaker than others available are. After three to six months, the dosage can be reduced to two to three capsules a day. The manufacturer does not list effects that may result from taking this supplement. There is a warning to check with you doctor for possible interactions if you are on other medications. Phenylketonurics, pregnant or nursing women and those taking MAO inhibitor drugs are not to use this product. Those with chronic high blood pressure should consult a doctor before using this product. 120 capsules, or 30 servings, costs $31.95 from the manufacturer when on sale or $44.95 under normal circumstances. BioSynergy allows a product to be returned within 30 days of purchase and they guarantee a full refund. The manufacturer says that the unused portion of the product should be returned to them, which implies that it can be returned after it has been opened although this is not clear. Neuro Clear has received many glowing reviews from customers, which seems to suggest that it is both popular and effective. This product has a number of positive points. For one thing, the manufacturer has received Good Manufacturing Practices (GMP) Certification. Neuro Clear has received excellent reviews from customers who were clearly pleased with the effectiveness of the supplement. It has a fair guarantee although some details are somewhat unclear, like whether the product is returnable after being opened. It does have its negatives as well. Judging by the high intake of capsules required on a daily basis, it seems that Neuro Clear may be weaker than other brain activity boosting supplements. It is also not clearly outlined by the manufacturer whether their product is vegetarian-friendly and it is never stated whether children can use this. Henry Costa	reviewed BioSynergy Neuro Clear	on November 20th	 and gave it a rating of 3.